The Osprey (left) has traditionally been considered to belong to its own monotypic family, the Pandionidae. This arrangement emphasizes several unique features of this "fish-hawk:" numerous adaptations for a life of fishing (reversible outer toe, spiny foot pads, nasal valves that close underwater, and more). The Osprey's wings are long and rather narrow (left), and held sharply angled at the carpal joints. This wing structure allows for long migrations on strong wingbeats and short glides, rather than a reliance of thermals. The large black carpal patches and the black line through the eye to the hindneck are its most distinctive plumage patterns. It is always very impressive to watch an Osprey hunting low over a lake, and then grabbing a large fish with its feet! Sometimes it then has to battle aerial pirates — including Bald Eagles — to bring the fish to a favored perch for consumption. 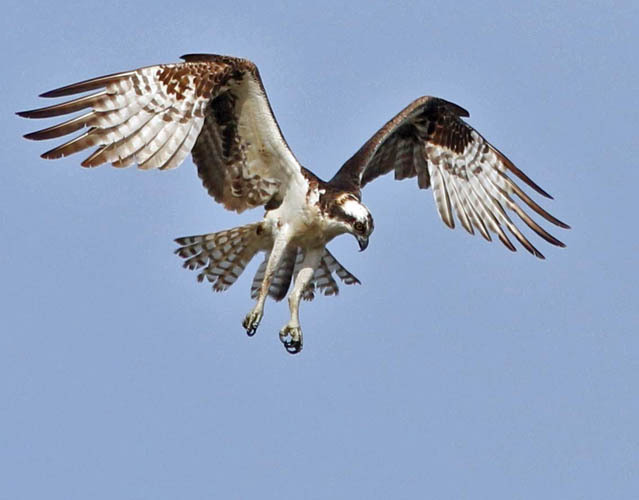 Because it is so widespread and is conspicuous around the margins of lakes, swamps, and on coastlines, Ospreys have been widely studied, and much is known about their ecology, behavior, biology, and migrations. Bretagnolle & Thibault (1993), for example, conducted a two year study on Osprey communications on Corsica. The identified 11 visual displays that are used to communicate in a semi-colonial environment without feeding territories. Protecting the young in the large exposed nests (bulky nests built atop drowned trees in many cases) is a key element in these communications. Here (right), an adult is still involved in nest-building, and is bringing in some moss for the center of the nest. 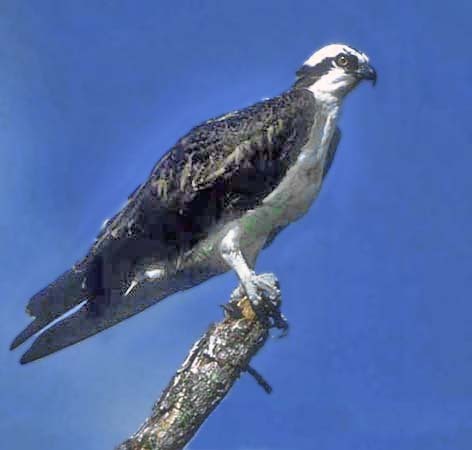 Poole (1994) lists four subspecies of Osprey: migratory populations in North America and Asia (P.h. carolinensis and nominate halietus, respectively) and two non-migratory populations (P.h. ridgwayi in the Caribbean; cristatus from Java and New Guinea through Australia). Poole (1994) points to an interesting fact: despite its long history, Osprey has not evolved into different species. The fish-eating Haliaeetus sea-eagles, in contrast, have evolved into 8 separate species over a range nearly identical to that of the Osprey. Most of these eagles are, however, non-migratory, allowing for isolation and speciation. The long-distance migration of much of the Osprey population has permitted interchange between populations and less chance for subspecies to become isolated and evolve as species over time. As it is a worldwide bird, this is surely the easiest of all monotypic families to locate! This one (right, in a fine shot by John Van de Graaff) is of the North American race carolinensis, in the Florida Everglades. Its fossil record goes back 15 million years (Poole 1994), and its adaptations as a fish-eating specialist have made it one of the most successful birds on earth. It has one of the widest ranges of all birds — it is found on every continent (except Antarctica). In the Old World it breeds as far north as Norway and as far south as Australia, and winters widely in Africa. In the New World it breeds from Alaska to the Caribbean, and winters in South America. It eats both freshwater and saltwater fish, permitting it to exist in a very wide range of water-margin habitats. The local status of Osprey has been of some concern in many locales. Major declines in the northeastern United States in the 1960s-1970s were tied to DDT and other pesticides. 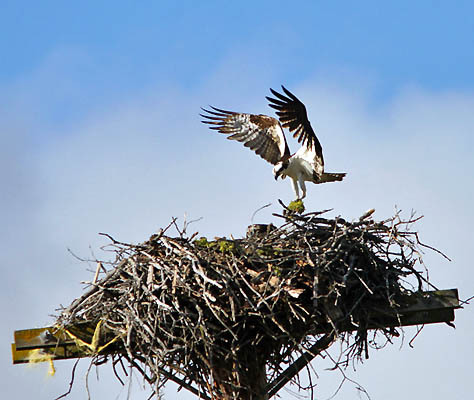 After the banning of DDT, there were major efforts to re-establish Ospreys in coastal lagoons along all of the east coast by building nesting structures; today an International Osprey Society continues these efforts (web cams at nest sites are featured from time to time). Where I live in Monterey County, California, Osprey is a scarce but widespread migrant and winter visitor. A few winter on Elkhorn Slough every year. This is near where nesting was known, just over the border in Santa Cruz County, a century ago. Efforts to have nesting Ospreys in Monterey County (e.g., by building nest platforms at Elkhorn Slough Estuarine Reserve) have yet to succeed, but I wouldn't be surprised to learn of a nest here or somewhere on Lake San Antonio sometime in the future (see Roberson 2002 for more on local status). Photos: The hovering Osprey Pandion haliaetus was at Moss Landing, California, on 17 Jan 2015. The nest-building adult was at Iron Gate Reservoir, Siskiyou Co., Calif., on 24 June 2012. The Everglades bird was taken by John Van de Graaff in Florida in Dec 2001. 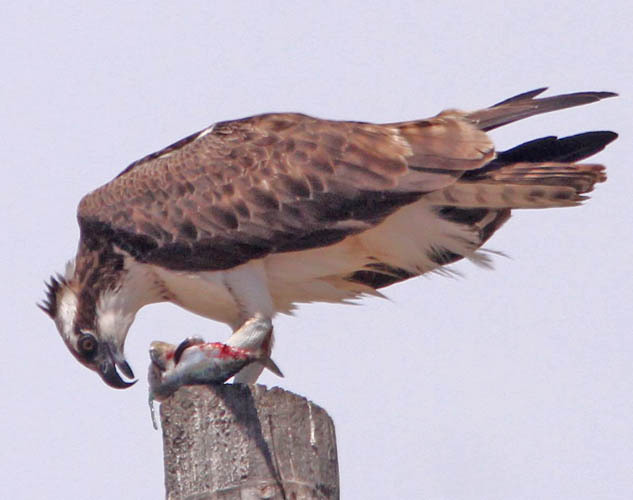 The fish-eating Osprey was at the Salinas River mouth, Monterey Co., Calif., on 29 Aug 2015. All photos © D. Roberson except that photo © John Van de Graaff, and used with permission; all rights reserved. Poole (1989) is an entire book on the life history and ecology of Osprey; we might think of it as a family book. An excellent introduction to this family, incorporated much research and extensively illustrated with great photos, is in Poole (1994). Bretagnolle, V., and J-C. Thibault. 1993. Communicative behavior in breeding Ospreys (Pandion haliaetus): description and relationship of signals to life history. Auk 110:736-751. Poole, A.F. 1989. Ospreys. Cambridge Univ. Press, Cambridge, U.K.
Poole, A.F. 1994. Family Pandionidae (Osprey), pp. 42-51 in del Hoyo, J., A. Elliott, & J. Sargatal, eds. Handbook of the Birds of the World. Vol. 2, Lynx Edicions, Barcelona. Roberson, D. 2002. Monterey Birds, 2d ed. Monterey Pen. Audubon Soc., Carmel, CA.